The concept of creating a 3D model for Fascial Counterstrain was first conceived during a Tony Robbins Business Mastery conference attended by both Brian Tuckey and Tim Hodges in January of 2014. Though there were several web-based 3D models of the human body already in existence, none of them had the flexibility or the customizable features necessary to achieve the end result that we desired. In May of 2014 after months of negotiating with a few company’s that already had models, we chose to contract with a team of 3D game developers from the Ukraine to perform their programming magic and build us a custom model. By the Summer of 2014 the model construction process had begun and we were on weekly conference calls with the development team. Months gave way to years and eventually more than two years worth of work and revisions and fine tuning of the model has resulted in a very detailed and accurate representation of the human form. Most notable about this model is the implementation of a custom labeling tool that allows us to precisely place points on the 3D model itself. Not only can this be done to the skeletal layer, but also the soft tissue and nerve layers. This is a huge bonus in terms of specifying the correct palpation layer and direction for all tenderpoints. It was also no easy task to accomplish for the development team. Though it may appear self explanatory, the reason behind the development of the model is three-fold. The expanding nature of modern day Fascial Counterstrain has necessitated a centralization of information to facilitate updating the many hundreds and thousands of practitioners. The amount of information expected of advanced Fascial Counterstrain practitioners has greatly exceeded the level of practical application that was common to associate with Jones-Strain and Counterstrain. The growing complexity and density of tenderpoint palpation requires an educational tool that simplifies the assimilation of information. Fascial Counterstrain has advanced at a rapid pace over the last 8 years. The shear volume of structures to treat is rapidly becoming a list of nearly every anatomical structure. Without a tool such as 3D Counterstrain, assimilating and using Fascial Counterstrain effectively can be an overwhelming task for the practitioner. Fascial Counterstrainers must know surface anatomy and bony landmarks in exquisite detail. One location can have 3 or 4 points depending on your direction of palpation. This complexity is what eventually led to the conversation on how best to develop and implement the 3D model idea and see it through to a reality. What you see with 3D Counterstrain is what we see as the developers of the technique. 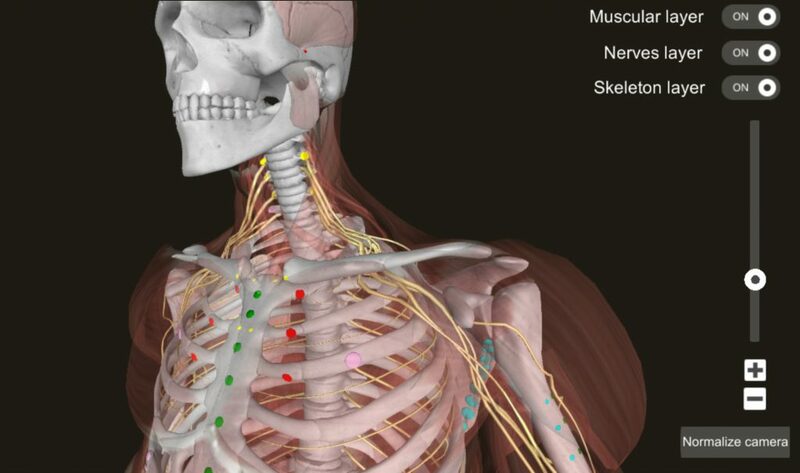 Every system and every structure represented in detail on an easy to manipulate 3D model with single click access to the entire body of work known as Fascial Counterstain. Finally, Fascial Counterstrain has arrived in the 21st century and its newest form can be yours anytime and anywhere. With this latest development, the cutting edge 3D model is literally at your fingertips on the web or in your pocket, on your iOS device. Come join the Fascial Counterstrain revolution and change lives by addressing causal dysfunction, not just symptoms.